Goodgame Studios proudly announces that the recent release of the mobile version of browser hit, ‘Big Farm’, has been the best game launch the company has ever experienced. 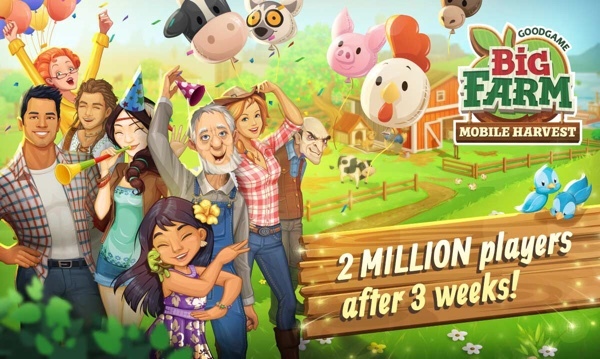 Even though it has only been available globally for three weeks, 2 million players have already installed ‘Big Farm: Mobile Harvest’ on their phone. And even more importantly, people are really enjoying the gaming experience. “In terms of both play and pay activity, these are the highest numbers we’ve ever seen from a game in our entire history.” says Kai Wawrzinek, founder and CEO of Goodgame Studios. After only three weeks, millions of players from 234 countries joined the game to build and manage their own farm and team up in cooperatives to help each other as best as they can. Since ‘Big Farm: Mobile Harvest’ has lots of cooperative features, thus a big and vibrant community is a key to success. “We are very happy to see that so many players have fallen in love with the game already. The team will regularly add more content to the game to provide our farmers with exciting events and tasks,” said Head of Studio Simon Andrews, whose team is responsible for ‘Big Farm: Mobile Harvest’.